Museums are great places for people to connect with history. Seeing the physical objects otherwise only learned about in distant classrooms can make an impact on people young and old alike. And while there are interesting museums almost everywhere you go, wouldn't it be nice if you could sometimes bring the museum to you? 3D printing is now making that possible. Many museums are 3D scanning objects in their collection and posting them for free online. This allows anyone with a 3D printer to download and print out the objects. Depending on what the object is, you can either print out a scale model of it, or a full-sized version. And that is precisely what we decided to do to put this concept to the test. The British Museum, located nearly on the other side of the planet from our office, is home to the Gayer-Anderson Cat, an Egyptian statue cast in the Late Period some 2,600 years ago. The museum 3D scanned the statue and uploaded it to MyMiniFactory, an online 3D model library, alongside a large number of other items. Without the base, the model is 340 mm tall, too tall for most 3D printers. Using Netfabb Basic, a free software tool, we cut it in half and began printing it. In one day the Gayer-Anderson Cat materialized in our office, full-scale. There is something very appealing about being able to pick up, move around, and really study the details of an artifact, and now, 3D printing allows anyone with the inclination to study museum artifacts, no matter where they are on Earth. 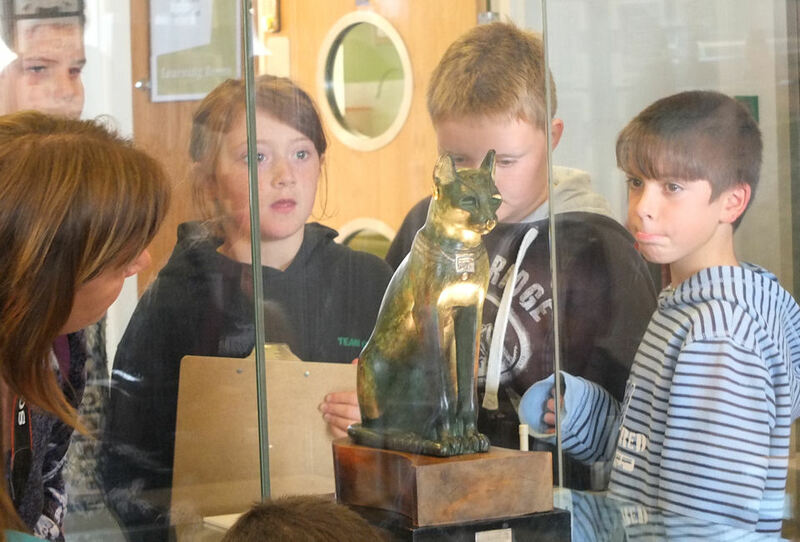 Lucky students viewing the original Gayer-Anderson Cat in The British Museum. For educators, having students pick out, study, and print physical representations of objects being learned about in class brings a new hands-on dimension into the learning process. For us, with a day to wait before the entire model was completed, we were able to flip through The British Museum's 13 page technical research bulletin (PDF) on the artifact. In it included x-rays of the statue, a description of how archaeologists believe it was made, and just about any other detail you could ever want to know about it. While with every 3D print something new is learned technically, this is one of the few instances where we also learned something historically as well.